Last Tuesday we were proud to make a difference in the lives of those in need. 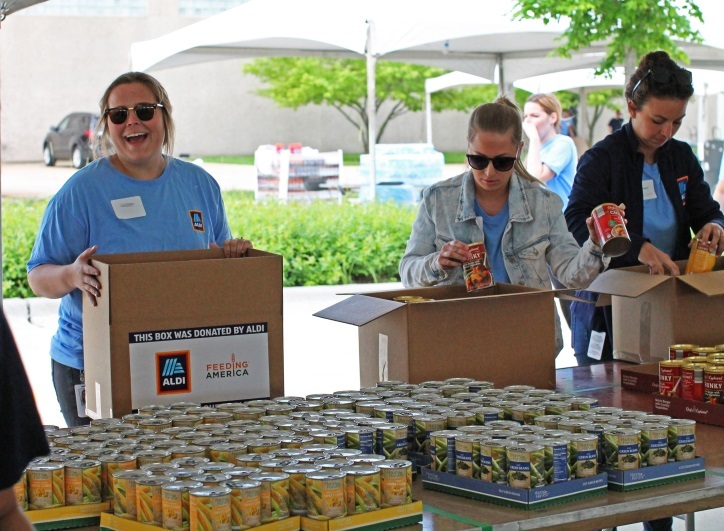 In partnership with Feeding America and the Northern Illinois Food Bank, over 600 of our awesome employees volunteered to pack relief boxes. Read on to learn more about the event and how you can help! Summer is a busy season for disaster relief. When disasters strike, boxes are distributed to those affected. These boxes are filled with nonperishable items such as canned soup, fruit cups, granola bars and peanut butter. 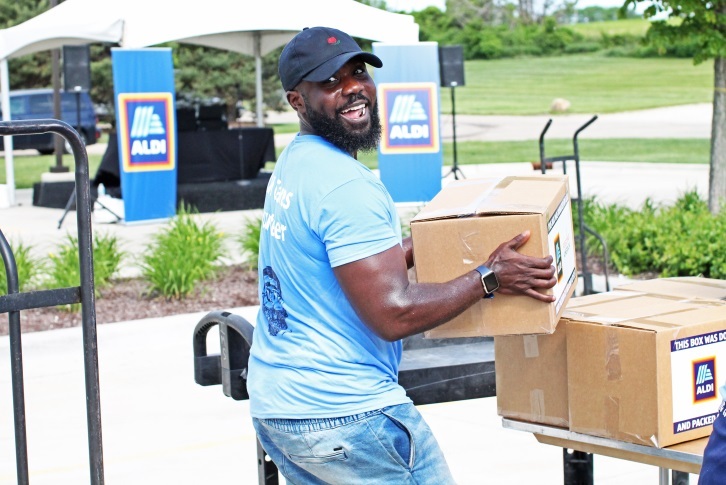 Organizations like Feeding America and the Northern Illinois Food Bank make it their mission to get food and supplies to those experiencing hardship. We participated in a similar volunteer event in 2017, packing 2,000 relief boxes for Feeding America. When Hurricane Harvey, Irma and Maria hit, our boxes were sent to those affected by the storms. As a business who believes in giving back, we increased the amount of boxes this year to 3,000. They will be shipped to four strategically placed Feeding America warehouses across the country. This allows for fast, effective deployment during a natural disaster. Employees began the day with an inspiring message from ALDI USA President Dave Behm. Matt Knott, President of Feeding America, and Julie Yurko, President & C.E.O. of Northern Illinois Food Bank, described how acts of kindness make a difference to struggling individuals and families. Their encouraging stories built excitement for the event. Employees signed up for specific tasks including box building and packing, box transportation, pallet building, table restocking, cardboard breakdown, silverware packing and note writing. A DJ pumped popular tunes to motivate and keep volunteers moving. It was amazing to see so many employees come together for a common cause. 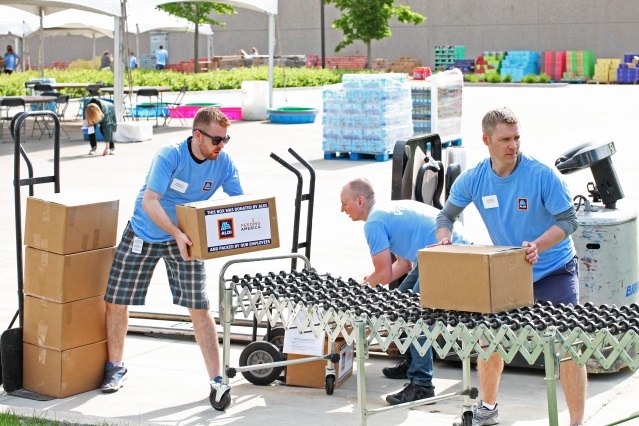 Next time you’re scrolling our social channels, look for #ALDICares to see our employees in-action. We pride ourselves on offering high-quality products at affordable prices, but we also believe in building strong communities. During our event, we were honored to give Feeding America a $100,000 donation to assist with efforts. 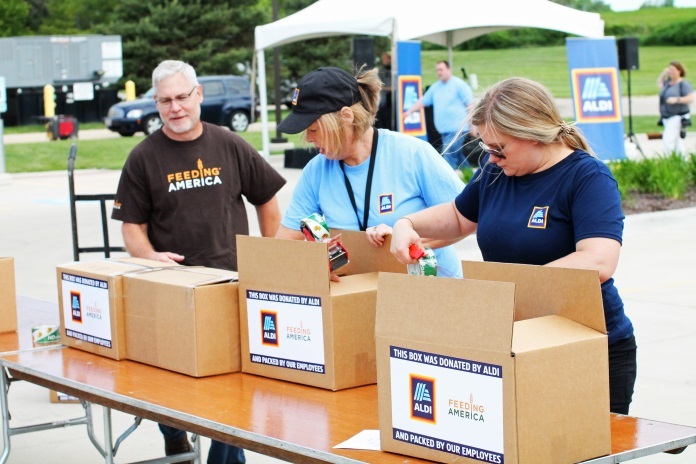 Our stores partner year-round with Feeding America food banks by donating overstocked food. Visit here for more information about how we give back to the communities who support us. We know our consumers care as much as we do about community giving. If you haven’t already, check out your local food pantry to see how you can help. Visit Feeding America’s website to search for your local food bank by zip code. Your food bank may accept boxes of food similar to what we packed, or you can opt to make a financial contribution. Every cent counts! 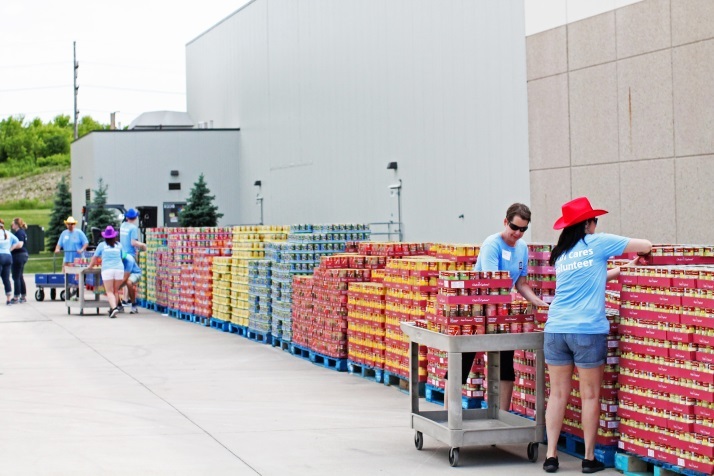 Organizations like the Northern Illinois Food Bank also welcome volunteers and host events where proceeds go towards feeding hungry families. We want to thank our Corporate Responsibility and Campus Connect teams for coordinating this year’s event. Thanks, of course, to all of our outstanding volunteers! We also want to thank our partners, Feeding America and Northern Illinois Food Bank. Lastly, thanks to all of our shoppers. By visiting our stores, you allow us to succeed and to continue our commitment to the community. We feel thankful and full of #ALDILove. Would Aldi be interested in donating food to Amazing Grace Food Rescue in Middletown, Delaware. We feed 25 and up families each week. We are not a money ministry there for we depend on donations to help feed our families who come to us for food.